Dr. Mehmet Oz's rebuttal to his critics aired on local stations across the country Thursday, part of a public relations blitz that includes an essay in Time magazine and an interview on NBC's "Today" show. Oz, arguably America's best-known doctor, is going on the offensive after a group of ten doctors wrote to Columbia University last week and asserted that he should be stripped of his academic credentials. Oz felt much of the ensuing media coverage of the letter was slanted against him. Thursday's episode of "The Dr. Oz Show" was billed as being "The Truth About His Critics." "It's ironic that I am being accused of a conflict of interest by these doctors," Oz said, "when, as you are about to see, some of them have their own conflict of interest issues -- and some integrity ones also." He introduced a lengthy report by one of his show's contributors, Elisabeth Leamy, who described how some of the ten doctors "have big ties to big industry." Leamy's report strongly suggested that the doctors are attacking Oz because of his stance on genetically modified foods. The letter to Columbia cited Oz's "baseless and relentless opposition to the genetic engineering of food crops." "That is not true," Oz said on the air. "I have never judged GMO foods. But just like 64 countries around the world, I support GMO labeling so you can decide on the foods for your family." "My interest was and is solely to protect the academic respectability of a prominent medical institution," the statement said. "Dr. Oz's record speaks for itself, and there is plenty of data which suggest that his medical judgment is questionable. I have every reason to believe that Columbia University's senior management will do what's in the best interest of a great institution and the public." A second letter-signer, Gilbert Ross, also issued a rebuttal to Oz. "Instead of addressing the primary concern — that he often dispenses questionable medical advice — Dr. Oz has chosen to evade responsibility on this topic by once again changing the subject," Ross said. "He's personally attacking his critics, while at the same time claiming they are trying to silence him," Ross added. 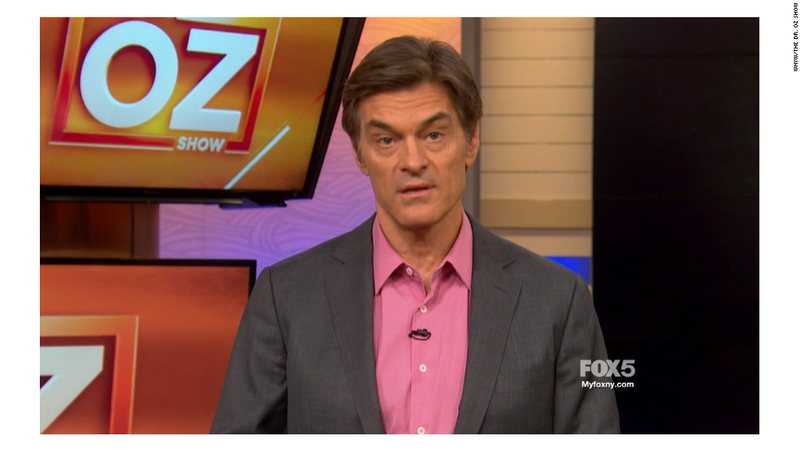 "Let's be clear: No one is looking to deny Dr. Oz his right to free speech. All the public deserves is that when he speaks, he sticks to offering sound medical advice that helps his viewers, rather than causing them harm." Meanwhile, eight members of the Columbia faculty wrote an opinion column on Thursday that included praise for Oz but said that some of the content on his show "sullies the reputation of Columbia University and undermines the trust that is essential to physician-patient relationships." The faculty members concluded the column by saying that "the medical and legislative communities give insufficient scrutiny to media-medicine. Barring such scrutiny, Dr. Oz might begin each program with a simple disclaimer: 'The opinions expressed on this program may not be evidence-based or part of accepted medical practice and have no endorsement from Columbia University.'" On television on Thursday, Oz also had one of his allies, physician and advocate of alternative medicine Joel Fuhrman, on set to critique the ten doctors in more detail. "It's ugly. It's ugly," Fuhrman assured Oz. "Number one, they're not representative of the medical profession. Number two, it is not an attack just against you. It is an attack against all physicians, all health care professionals, all people who maybe don't take a standard party line." Oz devoted almost half an hour to the full-throated defense. In his introduction, he said "the ten doctors who attacked me got what they intended: sensational headlines and sound bites. I have long believed that doctors should never fight their battles -- or each other -- in public. But now I believe I must." Oz also detailed his defense in an essay for Time that was published Thursday morning. "We're not going anywhere," he assured fans in the article. Oz wrote that Miller "appears to have a history as a pro-biotech scientist, and was mentioned in early tobacco-industry litigation as a potential ally to industry. He also furthered the battle in California to block GMO labeling -- a cause that I have been vocal about supporting." Miller's support for bio-tech foods is "a motive for the letter," Oz asserted. Oz wrote that he's "not that concerned about GMOs themselves," but believes "the freedom to make an informed choice should belong to consumers." He also acknowledged in the Time magazine essay that some criticism of him and his talk show is a good thing. "I don't expect all of my colleagues to understand this marriage between conventional medicine and the broader definition of wellness that the show pursues," he wrote. "I expect and respect the criticism of colleagues who struggle with my approach and I try to improve the show accordingly."